Google+ pages launched for everyone yesterday. And there have been tons of businesses creating pages for the last 24 hours. From news to fashion to the Muppets. And, yes, Social Fresh has a Google+ page already, too. 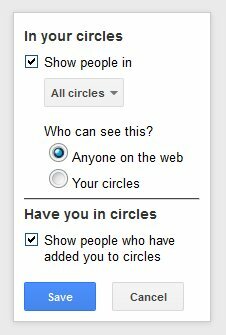 Google Plus has Circles, while Facebook has smart friend lists. You can create a Google+ page for your business right now if you want. We already have a post up on How To Create A Google+ Page. Once you do, use these 11 tips to get your business started and moving in the right direction. To manage, edit or cruise Google+ AS your page, simply go to your Google+ profile homepage and click on the small down arrow under your name. Be sure to share photos with all followers, as albums in the Photos tab are visible only to people with whom they’ve been shared. Geo location check-box feature in Google+. As your brand page, you can start adding other Google+ members and pages to your ‘circles.’ In order to add people to your circles, they need to add your page to their circles first. The page circle options include: Following, Customers, VIP’s and Team Members. There are several options allowing you to control what follower info users can view on your page’s sidebar. Your personal G+ profile can comment on brand pages, even if you haven’t followed them. However, I wasn’t able to comment on a brand page AS another brand page, whether I was following that brand or not. The ability to update Facebook and Twitter from Google+ is on the way. Google has given limited access to their Google+ API to developers and I’m sure additional access will be granted soon. All the API and geeky tech stuff you ever want to know can be found here: Google+ Platform Developers – https://developers.google.com/+/overview. If you use Chrome, you can install one of my fave Google+ sharing apps, Publish Sync. This app allows you to update both Facebook and Twitter from your Google+ profile. Currently, the app doesn’t work for my brand page, but it could soon. 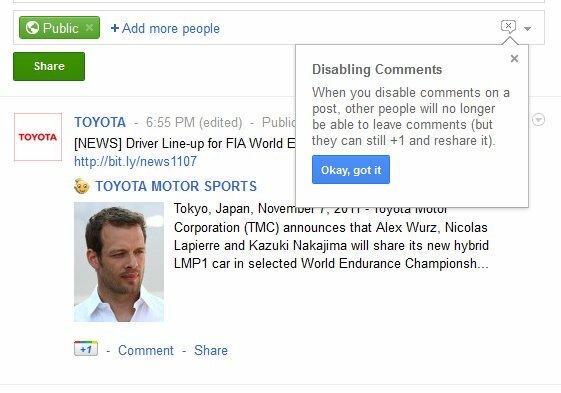 You can disable comments on posts you share via your Brand page. When you disable comments on a post, other people will no longer be able to leave comments (but they can still +1 and reshare it). There are currently 2 calls to action for your potential followers: Have them ‘circle’ you (or add your brand page to their circles) and +1 your page. It’s unclear currently how Google will leverage those who are +1-ing your page as it appears simply taking that action doesn’t allow the user to get any brand updates. As mentioned above, Google is calculating how many users +1 your page into their search results. And they are still the masters at search. So it makes sense that this will be important in Google Search. We will have to wait and see. Google isn’t yet allowing for customizing your brand page URL. However, there have been several tools created for that purpose. I used this one to shorten my brand’s page: http://gplus.to/. Social Fresh is simply redirecting their URL SocialFresh.com/google as a short cut to its page. So there are a few options out there if Google lags behind on this issue or, worst case, never offers this feature. Have you noticed any other Google+ page tips we should include? Let us know in the comments.